From Medusa... to beautiful. 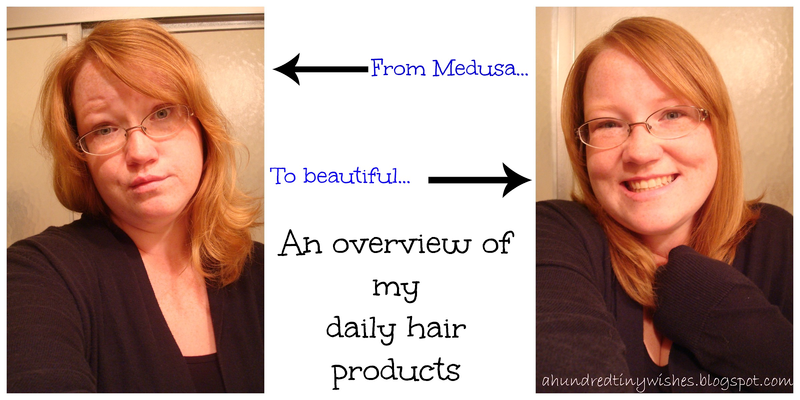 An overview of my daily hair products. Hair. A woman's best friend, and worst enemy. It comes in many colors, textures, lengths, and can be manipulated into thousands of different styles (and thanks to Pinterest, you don't have to have that much skill anymore). It can also make or break you. Ivana Trump once said, "Gorgeous hair is the best revenge", and Iris Apfel said, "If your hair is done properly and you have on good shoes, you can get away with everything." I, like many other women, have a want need for beautiful hair. Due to this need, I have developed a love for the messy bun. Hey, it's easy, takes less than five minutes, and looks amazing. But, when I'm not in the mood for a messy style, I like my hair shiny, sleek, and straight, especially when I wake up looking like Medusa. 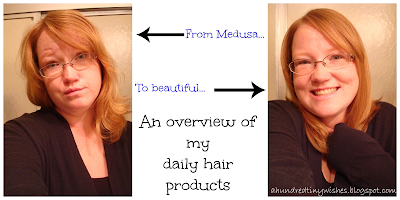 This post is meant to give you an overview of my daily hair product that I use to achieve my shiny, sleek, and straight hair. Btw, I am not wearing any makeup in the above pictures. I have just washed my face and put lotion on. I have an assortment of hair sprays, heat protectants, surf sprays, anti-humidity sprays and creams, dry shampoos, leave in conditioners, shampoos, and conditioners, basically a product arsenal that could very well rival most hair salons. I never throw any product out (unless it's icky, sticky, or down right nasty), but through all of my testing, I have my daily "tested and loved" old faithful's. They are a perfect combination to take me from looking like Medusa, to looking beautiful and amazing. Batiste Dry Shampoo in Blush: I don't wash my hair everyday, it's so thin, and if I did, then I wouldn't be able to do anything with it. 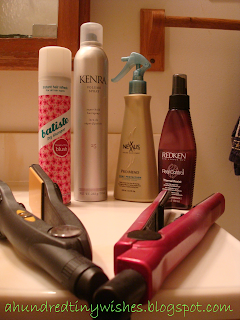 I use dry shampoo on day two and maybe three. It smells pretty, and doesn't leave my hair with the white powder residue. I will spray this on, and then blow dry, to smooth out my hair. Kenra Volume 25 Hairspray: I love this stuff. It's amazing. A strong hold, dries quickly, and doesn't stiffen up your hair. Nexxus Pro-Mend Heat Protector: Hair is not supposed to sizzle when you run a flat iron over it. This heat protectant doesn't weigh my hair down, seems to slow the heat damage, leaves my hair feeling soft and a little less frizzy. It's a light spray and doesn't leave any greasy feeling or residue. Redken Real Control Thermal Resist: I spray this all over my hair before using any product. It help to detangle and seems to alleviate the static I get after drying my hair. 4. Separate hair and spray Nexxus spray on each section before using iron.